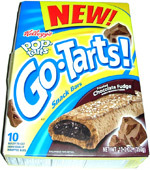 Taste test: A box of Go-Tarts contains 10 bags that each contain one Go-Tart. This contrasts with Pop Tarts, which include two tarts per bag. The bags say that Go-Tarts are not meant to be toasted or microwaved (but they don't say whether the Kellogg's Police will come knocking on your door if you do). Each Go-Tart is about the size of a hot dog (without the bun). The shell is made from the crusty material on a chocolate Pop Tart. The inside is a fudge filling, similar to Pop Tart filling. On top where you'd put the ketchup (or is it catsup? ), put a thin layer of chocolate frosting and white sugar flecks. So with all the elements looking like they came from regular Pop Tart, you would think it would taste exactly like a Pop Tart. But you'd be wrong. Somewhere in the translation, some taste got lost. It tasted more like a snack cake than a Pop Tart. Maybe there's too much 'crust' or 'cake' on the outside, and less chocolate filling on the inside. After eating one of these, I felt that I'd rather just eat a Pop Tart right out of the box. Smell test: Smells like chocolate cake. 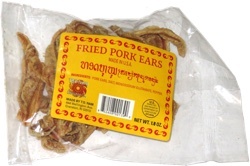 This snack was discovered by Keith at Shaw's in Ashland, Massachusetts. Review published .